I’ve seen actor and playwright Frank Ingrasciotta do his one-man show, Blood Type: Ragu, three times now over a period of what I think is about 10 years, and each time I see something that I didn’t remember from the previous performance, each time I’m amazed at how irreverent he can be while maintaining a love and loyalty to the idea of the Italian family. This latest performance is like the matured version of what I first saw all those years ago. And what you can see today is what the play was meant to be, and now you get to see it without having to have seen it go through all those earlier, sometimes awkward, stages. Blood Type Ragu - Dad Answers Phone from Blood Type Ragu on Vimeo. you recalling your own experiences; secrets and public knowledge are juxtaposed to create just enough tension to keep you wondering just where this guy is headed with all this. I had a chance to talk to the actor and playwright and offer you this brief entre into the mind behind and inside the show. Everyone has stories in their lives; how did you pick the ones that you would use to create this show? I picked stories that connected my first-generation experiences growing up and jockeying between two cultures. In the show’s early incarnation, I had many stories that talked about the Italian culture. I soon realized that as rich as they were, some had to be sacrificed for the sake of clarity. So I streamlined the writing focusing on the Holy Trinity: my father, my mother and me. There are also a few external stories about my brother and sister that dress it up. What responses have you had from your family regarding the material? during my upbringing to protect me from all that was going on. Who are some of your influences in terms of writing and acting? The people who influenced my writing are comedy writers -- Woody Allen, Mel Brooks, Sid Caesar and Carl Reiner. Also, Bob Carroll and Madelyn Pugh, who wrote all those wonderful “I Love Lucy” scripts. The people who influenced my acting are Jack Lemmon. He was a master of comedy and drama. I also love Anthony Hopkins, whose acting is more like channeling. There is also a French actor by the name of Romain Duris whose work I saw recently in the movie “Moliere.” He gives a very captivating performance that is so interesting to watch. How different is it doing your own work vs. someone else's? When I am acting in someone else’s work, I am constantly searching the script for clues to the character’s emotional behavior based on the intentions of the playwright. When it’s something I’ve written, my mind already knows the character’s traits and their emotional journey in the play. However, when I first started putting Blood Type: RAGU on its feet, I was struggling with the text and kept asking myself, “Who wrote this?” I had to keep reminding myself that I did. It was a bit of a challenge to bring it to life and take it off the page. I realized there were many lines I could cut because an expression or movement would take care of the moment. I also had to completely let go of the playwright part of me and move into being an actor that was portraying 20 different characters. I had to come up with a voice and body movement for each of them. How is this show different from its earlier incarnations? The basic spine of the show is the same as it was during its first production nine years ago at the Belmont Playhouse. However, I am a different person than I was nine years ago and I feel I have much more life experience that I can give to it. Also, through the work of the director Ted Sod, I feel it’s much more specific and enhanced. What were the major challenges in putting on a one-man show and how do you prepare for it? I have to pace myself. A performance day becomes about preparing for those 90 minutes. 180 minutes when I have two shows. It’s like training for a marathon to perform eight shows a week. I’ve lost 18 pounds since I’ve started rehearsals. My daily regimen consists of meditation, stretching, steaming my vocal chords, resting my voice, staying off the phone, eating healthy, no alcohol (I miss my glass of wine with dinner!). What do you envision as a future for this show? I would like to have a long run and tour it around the country - especially in cities like Boston, Chicago and Providence. Many people have told me it’s got a cinematic quality, so I would love to explore the idea of adapting it into a movie. But, for now, it’s an honor to perform the show and I’m grateful for all the support I am receiving from audiences. In addition to the general theater-going audience, I hope the Italian-American community will embrace the show as a work that speaks of family, culture and embracing heritage. 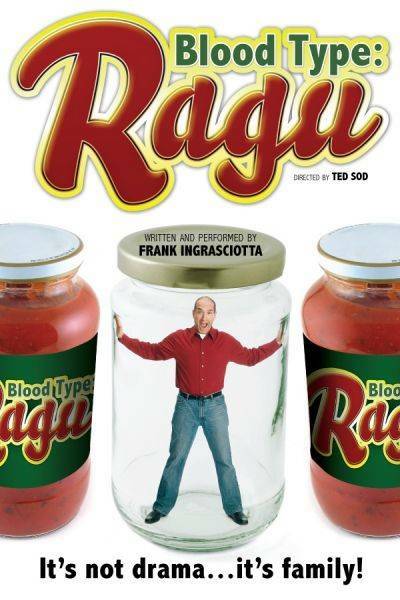 Blood Type: Ragu can be seen at: The Actors’ Playhouse. 100 7th Avenue South (Between Grove and Barrow) on Wednesdays at 2 p.m. and 7:30; Thursdays at 7:30P.m. ; Fridays at 8 p.m.; Saturdays at 2 p.m. and 8 p.m.; and Sundays at 2 p.m. and 6 p.m. Tickets are $47.50 Wednesdays and Thursdays; and $52.50 Fridays, Saturdays and Sundays. For tickets call (212) 868-4444 or visit www.BloodTypeRagu.com Groups of 10 or more call (641) 319-0634.